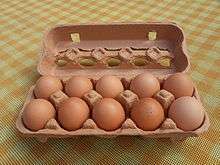 A carton of six eggs. These cartons have a dimpled form in which each dimple accommodates an individual egg and isolates that egg from eggs in adjacent dimples. This structure helps protect eggs against stresses exerted during transportation and storage by absorbing a lot of shock and limiting the incidents of fracture to the fragile egg shells. An egg carton can be made of various materials, including foamed plastics such as polystyrene foam, clear plastic or may be manufactured from recycled paper and molded pulp by means of a mechanized papier-mâché process. An "egg crate mattress", while following a similar form, is not used for egg transport. It is a light weight camping mattress which makes use of the dimpled structure to distribute and cushion human weight. This foam structure is also occasionally used in packaging to dampen impact of sensitive material during travel. Egg crate foam is used in shipping boxes and carrying cases to protect transported items. Similarly, acoustic foam tiles which help in sound proofing and the limitation of acoustic resonance have a similar form to egg crates. Egg crate mattresses are occasionally used as an inexpensive but poor substitute to acoustic foam which must meet noise reduction and fire prevention standards. 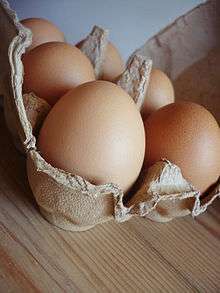 The egg carton was invented in 1911 by newspaper editor Joseph Coyle of Smithers, British Columbia, to solve a dispute between a local farmer and hotel owner in Aldermere, near present day Telkwa, in British Columbia, over the farmer's eggs often being delivered broken. Wikimedia Commons has media related to Egg containers.